I am quite proud of this top! It’s a completely improvised design, made for my friend’s baby’s first birthday…which is still a long way off, but I couldn’t wait to use my Laurie Wisbrun fabric. I bought several yards of Denyse Schmidt fabric from the Hope Valley line at Hawthorne Threads for a half-square triangle quilt I’m making (I know, I know…they’re everywhere! ), but I decided to cut into it for this little top…and I’m so glad I did! I used Kona cotton in Charcoal for the background. I’m actually almost finished with the quilt…I made the pieced back last night and plan to do the sandwich in the morning. For some reason, I think it’s just screaming to become a tied quilt, and I have some tweedy, black yarn that’s been collecting dust bunnies in my stash for two years and wants to be employed in just such a project. If you haven’t heard of Laurie Wisbrun, she’s a wonderful, (formerly) independent fabric designer. Her fabric is going to be released by Kaufman in the spring, which is very exciting to me! I love her chairs and sofas series, and I bought the very last FQ of the chartreuse sofa fabric in her shop. It’s about to become a small pillow. I think her fabrics are great for children, but suitable for adults (see here) as well. 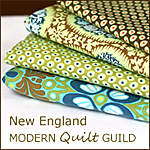 I hope to have FO shots of these projects soon…until then, happy quilting!